Some time ago I've written a tiny article, explaining how converting of HTML or TEXT file content inside file can be converted with iconv. Btw I just recently learned how one can look for few, file extensions with find under one liner the argument to pass is -o -name '*.file-extension', as you can see from example, you can look for as many different file extensions as you like with one find search command. After completing the convertion, I've remembered that earlier I've also used iconv on a couple of occasions to convert from Cyrillic CP-1251 to Cyrillic UTF-8, thus for those who prefer to complete convertion with iconv here is an alternative a bit longer method using for cycle + mv and iconv. As you see in above line of code, there are two occurances of move command as one is backupping all .html files and second mv overwrites with files with converted encoding. For any other files different from .html, just change in cmd find . -iname '*.html' to whatever file extension. 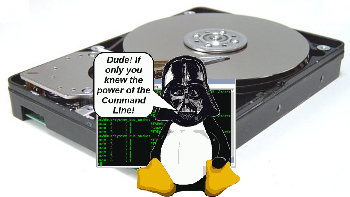 I've earlier wrote an article How to find which processes are causing hard disk i/o overhead on Linux there I explained very rawly few tools which can be used to benchmark hard disk read / write operations. My prior article accent was on iotop and dstat and it just mentioned of iostat. Therefore I've wrote this short article in attempt to explain a bit more thoroughfully on how iostat can be used to track problems with excessive server I/O read/writes. I will further proceed with few words on how iostat can be installed on various Linux distros, then point at few most common scenarious of use and a short explanation on the meaning of each of the command outputs. iostat is a swiss army knife of finding a server hard disk bottlenecks. Though it is a must have tool in the admin outfut, most of Linux distributions will not have iostat installed by default. c) On Slackware Linux sysstat package which contains iostat is installed by default. d) In FreeBSD, there is no need for installation of any external package as iostat is part of the BSD world (bundle commands). I should mention bsd iostat and Linux's iostat commands are not the same and hence there use to track down hard disk bottlenecks differs a bit, however the general logic of use is very similar as with most tools in BSD and Linux. The %user 15.34 meaning is that 15.34 out of 100% possible i/o load is generad by system level read/write operations. %nice – >Show the percentage of CPU utilization that occurred while executing at the user level with nice priority. %iowait – just like the top command idle it shows the idle time when the system didn't have an outstanding disk I/O requests. %steal – show percentage in time spent in time wait of CPU or virtual CPUs to service another virtual processor (high numbers of disk is sure sign for i/o problem). The above iostat output reveals in my specific case the server is experiencing mostly Disk writes (observable in the high MB_wrtn/s 8.19 md0 in the above sample output). It also reveals, the I/O reads experienced on that server hard disk are mostly generated as a system (user level load) – see (%user 15.34 and md0 2118.70). For all those not familiar with system also called user / level load, this is all kind of load which is generated by running programs on the server – (any kind of load not generated by the Linux kernel or loaded kernel modules). [root@centos ~]# watch "/usr/bin/iostat -m"
Even though watch use and -d might appear like identical, they're not watch does refresh the screen, executing instruction similar to the clear command which clears screen on every 2 seconds, so the output looks like the top command refresh, while passing the -d 2 will output the iostat command output on every 2 secs in a row so all the data is visualized on the screen. Hence -d 2 in cases, where more thorough debug is necessery is better. However for a quick routine view watch + iostat is great too. Most of ppl will never need to use this, but it is good to know it exists. BSD's iostat is a bit different in terms of output and arguments. As you see in the output, there is information like in the columns tty, tin, tout which is a bit hard to comprehend. The output info is quite self-explanatory. Btw fstat is sometimes helpful in identifying the number of open files and trying to estimate which ones are putting the hdd load. Hope this info helps someone. If you know better ways to track hdd excessive loads on Linux / BSD pls share 'em pls. If you still have some old dusty CDs left on the CD shelf, its quite cool to give it a ride in a rainy morning. As I enjoy working in console so much, I thought it might be interesting to share how music audio CDs can be listened in plain text mode console. For all console / terminal geeks Linux and BSDs can be equipped with a number of text/console audio cd console players. There are plenty of free software console cd audio players on the net, however I found cdplay , cdcd and dcd to be the most popular ones. To play audiocds in console on FreeBSD , a command tool dcd is available and installable through ports. dcd is also available for Linux but on most GNU/Linuxes it has to be built from source. dcd has plenty of great arguments, to get some fun with it check the man page. Another program that can be used to play audio CDs on both Linux and BSDs is the "classical" mplayer . The argument -cache 5000 has to be passed to to work around choppy sound (if for example audio playback interruptions every few milliseconds). 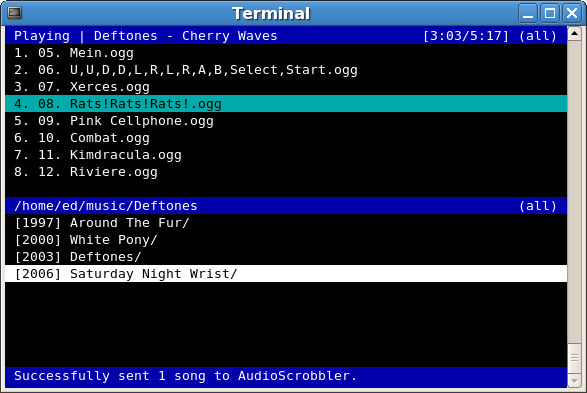 For people who are keen on ncurses (Midnight Commander) like command line interfaces you might enjoy Herrie – a minimalistic music player that supports plenty of sound formats, including audiocds. Ports are also available for FreeBSD, NetBSD and OpenBSD. I'll be happy to hear feedback and recommendations on any other console audio cd players I might forgot to mention. Which is your favourite console text based cd audio player?